In the morning of October 15, 2006, two strong earthquakes occurred on the underwater segment of the major rift zone of the Hualalai volcano on the Northwest side of the Island of Hawaii. The earthquakes affected mostly the North Kona and the Kohala areas of the island but extensive damage occurred also in the islands of Maui and Oahu. There were many injuries but no deaths were reported. No tsunami of significance was generated. 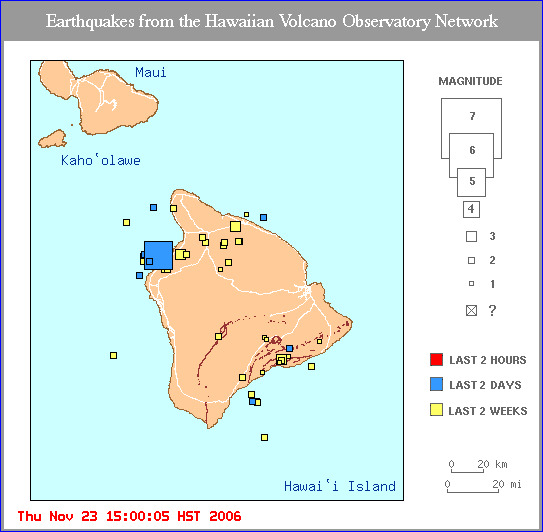 Two earthquakes occurred in Kiholo Bay on the northwest side of Hawaii Island, early on Sunday morning, October 15, 2006. Origin date and time: Sunday, October 15, 2006 at 17:07: 48 (UTC) (7:07: 48 AM local time). Epicenter: 19.878°N. 155.935°W about 6 miles NNW of Pauanahulu off the northwest coast of Hawaii and about 20 km northeast of the Kona airport. Magnitude: The original magnitude was given as 6.5 but later revised to 6.7. Focal depth: Estimated at 29 km (18.0 miles) (according to the U.S. Geological Survey's Hawaiian Volcano Observatory). The quake was felt as a steady, rumbling shudder that shook houses, cracked buildings and swayed high-rises. It was the largest recorded in the island of Hawaii since the November 16, 1983, earthquake, which had M6.7 and occurred under the east flank of Mauna Loa. Second Earthquake - The second earthquake occurred seven minutes later. Its magnitude was 6.0. Its epicenter was about 44 km north of the Kona airport. Its focal depth was shallower at 20 km. Earthquake Intensities - The earthquakes were felt most strongly in the North Kona and Kohala areas. The shaking was strong enough to cause power generators to trip offline in Hawaii, Maui, and Oahu counties. About 80 aftershocks with magnitudes greater than 1.7 were recorded in the first 24 hours. The largest with a magnitude of 4.2 and occurred at 10:35:21 AM HST on October 15. It was located at sea at 20.09 N, 155.97 W. Most of the subsequent aftershocks had focal depths of less 20 km and were concentrated under the Hualalai volcano. Most of the damage occurred on the west side of the island of Hawaii but there was also damage on Maui and Oahu. There were no reported fatalities. The earthquake disrupted air traffic on all major islands and knocked out power on parts of the Big Island, Maui and all of Oahu. On the island of Hawaii, there was major structural damage at Kona Hospital, the Royal Kona Resort and the Honokaa Long-term Care Facility. There was also some damage to the ceiling at Kohala Hospital. There were reports of boulders crashed onto the highways. The state Department of Transportation estimated the damage to state roads and bridges at about $20 million. Total damage estimates are expected to increase to over $200 million. On the island of Oahu there was major power outages that forced the disruption of flights at the Honolulu International Airport. The City of Honolulu is the most populous and visited by tourists. Several flights out of Maui, and the island of Hawaii Island were disrupted or cancelled. The Hawaiian islands are located in the middle of one of the largest tectonic plates on Earth - the Pacific Plate. The islands were built by volcanoes formed by a 'hot spot' which has been migrating in a southeast direction for millions of years along a spreading center of the Pacific tectonic plate. 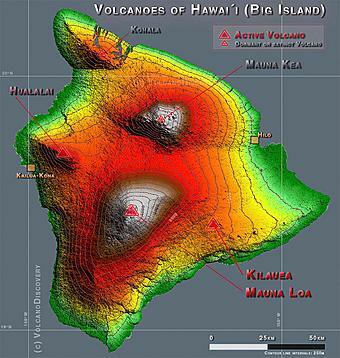 Most of the volcanoes that comprise the Hawaiian islands have become extinct and eroded - some to sea level. The island of Hawaii has been building up faster than it has been eroding. The weight of the island has buckled the earth's crust and isostatic adjustements often occur to establish gravitational equilibrium. The earthquakes of October 15, 2006 were caused by isostatic response to crustal loading on the island of Hawaii. The cluster of aftershocks below the Hualalai volcano and their apparent clustering and distribution along an almost east-west slip plane are in close proximity to the Hualalai volcano's northwest rift zone that extends offshore to the west but is truncated by the Mauna Loa volcano to the east. A cluster of similar earthquake occurred below the Hualalai volcano in September and October 1929. Hualalai is one of the five major shield volcanoes on the Island of Hawaii. Kohala, Mauna Kea, Mauna Loa and Kilauea are the other four. Kohala's last eruption was about 60,000 years ago and Mauna Kea 's last eruption was about 3,500 years ago - thus these volcanoes are considered to be dormant. Hualalai, Mauna Loa and Kilauea have been active in the last 100 to 200 thousand years and may have had simultaneous eruptions. The five volcanoes of the Island of Hawaii. Mauna Loa erupted in 1984. Kilauea is one of the most active volcanoes on Earth. In the last forty years it has erupted more than 30 times. Hualalai's last eruption was in 1801. Although this last eruption occurred over 200 years ago, Hualalai is considered active. The Hualalai volcano has a well-developed Northwest rift zone, a moderately developed South-Southeast rift zone, and a rather underdeveloped North rift zone. The volcano completed its main Tholeiitic shield-building stage about 120,000 years ago. The trachyte cone known as "Puu Waawaa" , formed about 105,000 years ago on the north rift zone and generated lava flows that traveled about 10 km (6 miles). Post-shield volcanism began about 100,000 years ago and covered the entire surface of the volcano. Hualalai is now in its post-shield capping stage. Although inactive at the present time, it could erupt again. Capping eruption events are usually more violent but usually localized. Hualalai's summit has an elevation of 2,523 m (8,271 ft) above sea level. The most recent eruptions occurred along the Northwest rift zone in 1800-1801. Two major flows from these eruptions reached the sea. The 1800 "Kaupulehu" flow traveled in a northward direction and destroyed a Hawaiian village in its path. The 1801 "Huehue" flow traveled eastward and reached the sea, where the present Kona's Keahole airport has been built. The 1800-1801 eruptions of the Hualalai volcano may have been concurrent with an eruption the Mauna Loa. 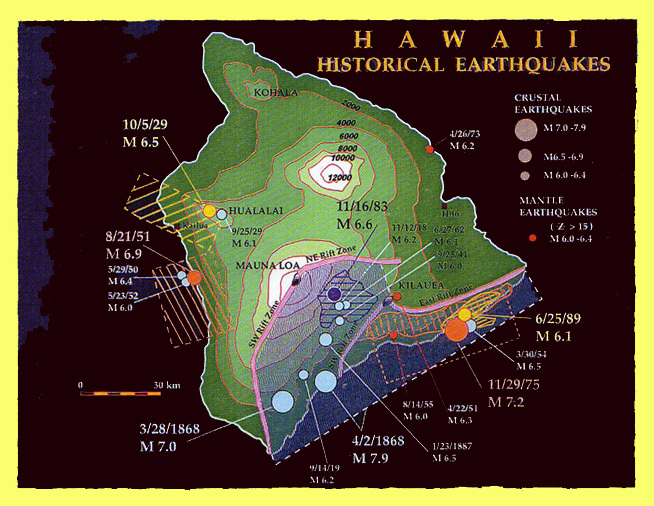 Historical earthquakes in the Hawaiian Islands have been well documented in two major publications: the modern (1959-1997) catalog of the Hawaiian Volcano Observatory, supplemented by the historic (1868-1959) catalog. November 16, 1983 - The most recent event, prior to the October 15, 2006 earthquake occurred under the east flank of Mauna Loa volcano. It had a similar magnitude of M6.7. November 29, 1975 - This earthquake had a magnitude of M7.2 and occurred beneath Kilauea's South Flank. April 2, 1868 - This earthquake had an estimated magnitude of M7.9 and occurred beneath the southeast flank of Mauna Loa. Strong and Major Historical Earthquakes on the Island of Hawaii (Note location of the 5 October 1929 earthquake on the Hualalai volcano - much closer to the summit and vents). As shown below a tsunami of small amplitude was recorded by the Pacific Tsunami Warning Center's (PTWC) tide gauge at Kawaihae harbor on the island of Hawaii. The travel time of the first wave to Kawaihae harbor was at about 17:15 GMTor aproximately 7 minutes and 12 seconds after the earthquake, which occurred at 17:07:48. The period of the tsunami waves at the Kawaihae harbor gauge was about 12 minutes. Such long period is extremely unusual given the limited dimensions of the earthquake source. The cause of this anomaly is being investigated. The smal tsunami as recorded by PTWC's Kawaihae Harbor tide gauge. Is the Earthquake of October 15, 2006 a Prelude to a Future Eruption of the Hualalai Volcano? The Hualalai volcano poses a real threat to the northwest region of the island of Hawaii because of the extensive recent urban development. The summit of the volcano is only a few km away from the city of Kailua. Lava flows from a potential future eruption of Hualalai represent the greater danger, rather than a pyroclastic eruption at the summit. Although more than two hundred years have elapsed since the last eruption, Hualalai will most definitely erupt again. The main earthquake of October 15, 2006 and the distribution of aftershocks closely align with the volcano's well-developed Northwest rift zone. Whether this quake is a prelude to a future eruption is not yet known, but it is possible and should be of concern. When such eruption may occur is not known. It could occur in the near future or years from now. The 1929 swarms of earthquakes - over a period of a month - did not result in any major activity of the volcano. However these earthquakes may have brought magma up and closer to the volcano's vents. The geologic history of Hualalai indicates that the volcano erupted about 200 times in the last 10,000 years. This would indicate a recurrence interval of about 50 years for eruptions. However, most of Hualalai's past eruptions have occurred in clusters, often separated by several centuries of inactivity. Whether the recent earthquake of October 15, 2006 will be followed by further upward magma movement, remains to be seen. The Hawaii Volcano Observatory is certainly keeping a close watchful eye on Hualalai's behavior. Can a Future Earthquake near the Rift Zone of the Hualalai Volcano Generate a Tsunami? The earthquake of October 15, 2006 had a focal depth of 29 Km which was rather deep to generate a tsunami. Also the afteschock distribtution indicates that most of the crustal movement occured on land along and under the Northwest rift zone of the Hualali volcano. The offshore crustal displacements were not large enough to generate a tsunami of any significance. The magnitude of the earthquake was 6.7 which is rather marginal for tsunami generation. However, it should be emphasized that a shallow crustal earthquake of 6.7 magnitude (or greater), near the volcano's decollement region (possibly at a depth of about 8- 10 km) - which may involve flank failure - has the potential to generate a significant and potentially dangerous tsunami that could affect, not only the island of Hawaii but also the other Hawaiian islands. Klein F. W. and Wright T. L., 2000. Catalog of Hawaiian Earthquakes, 1823-1959,U.S. Geological Survey Professional Paper 1623, U.S. Department of the Interior. Updated, World Data Center A for Solid Earth Geophysics, NOAA, 78 p., March 1977. Rundle J. B., 1988a. "A physical model for earthquakes: 1. fluctuations and interactions". Journal of Geophysical Research, 93(B6):6237-6254, June 1988. Rundle, D. Turcotte, L. and William Klein, editors, 2000. GeoComplexity and the Physics of Earthquakes, number 120 in Geophysical Monograph series, pages 211-218. AGU Books Board, 2000.